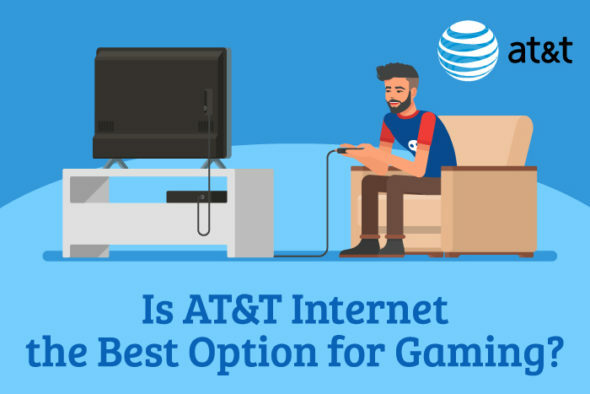 In this article we review AT&T’s internet for gaming. If you just want to sign up for AT&T internet now, click here. By using the link on this page you are guaranteed to get today’s lowest pricing, plus you get a $50 VISA reward card. We will get a small commission from AT&T, at no expense to you. We’ve all been there. You’re in the middle of what feels like the best game of FIFA of your life, It’s 2-2 with 90 seconds of extra time left. You get around their defense, just you and the goalkeeper left. You get closer and prepare to launch the ball in the top corner, and then… Your player freezes still, you lose possession of the ball and the other team skip past your defense and sink it in the back of the net. The controller either ends up being thrown across the room, or worse, beaten to death. You start cursing the company that just burned you for the pointless internet connection speed that they claim is competitive. And now you’re here reading this. Does this sound familiar? It should do, because you’re one of millions. Some call it lag, some call it latency, others call it a joke. I’ll explain this annoying phenomena in an easily digestible format; Latency is the time it takes for data to travel. You can think of it as the time between an action you take and the time for the game to respond. If you’re experiencing high latency, you’ll notice a delay between your action (like pressing the fire button on your controller) and the game’s response (like your character pulling the trigger and blowing the head off the enemy shoulders). Latency is measured in milliseconds, which may not seem like a big deal. But if you ask any serious gamer about in-game lag (also known as high latency), they’ll tell you it’s the difference between missing a perfectly-timed shot and getting play of the game in Overwatch. There are sometimes contributing factors that encourage this lag; From the variables of your computer such as CPU and RAM to the time of day and how many devices are using your router. Most of the time however it is within the control of your internet provider. AT&T offer their fastest internet; AT&T Fiber – “Rolling out the future of the internet today”. It sounds intriguing doesn’t it. So, let’s have a look at this in more detail. First, to summarize, the AT&T Fiber network provides gamers with a package that features an ultra-fast internet speed with no data caps and a higher bandwidth for a variety of devices. An internet package designed with the gamer in clear focus, at last! Their plans cover affordable options for playing all types of games. Whether you play casual strategy or sport games, or require a more advanced plan where players need quick reflexes, teamwork and strategic planning, AT&T will find a plan that is right for you. They’ve teamed up with their mobile gaming partner ESL, also known as the Electronic Sports League; An esports organizer and production company that produces video game competitions worldwide. ESL is the world’s largest esports company, and the oldest that is still operational. So, naturally, they know what their doing in terms of providing a flawless internet connection for their users. They put you in the front lines as gaming innovations continue to evolve; Whether you’re a casual player on mobile, or inside massive multiplayer Online Battle Arenas. This affiliation is the first of its kind. No other Internet Service Provider (ISP) has thought outside of the box like this. I’ll say it again; AT&Ts focus on the gaming industry assures you that they can be trusted, so you won’t miss any headshots, or freeze in the middle of your FIFA game. The best online gaming experiences require the right equipment, and AT&T has you covered. You can game across all your devices with Wi-Fi® and equipment included at no extra cost. Some other benefits include an enhanced Wi-Fi coverage which is very much consistent throughout your home. AT&T also have their own Wi-Fi concierge app, which allows you to effortlessly manage and monitor your home Wi-Fi network. They will also help keep you safe from viruses, spyware and other online threats with the AT&T Internet Security suite, powered by McAfee. New customers who sign up online for AT&T gaming internet get a $50 AT&T VISA Reward Card as a special sign up bonus. Click here to sign up online for AT&T gaming internet and get today’s lowest pricing, guaranteed. Game with AT&T Internet – affordable options for casual and advanced players. AT&T have been around since the invention of the telephone. They know what they’re doing, and own endless miles of phone lines that provide DSL and dial-up services to millions of customers all over the U.S. More recently, the telecommunications giant started providing a fiber optic internet service using the latest in fiber optic technology, soon to be every gamers best friend. All of AT&Ts packages provide Fiber. In case you didn’t know – Fiber technology uses light waves instead of electrical signals to transmit data, and distance from the network is no longer a limiting factor. Because of this, users on the network have higher speeds available to them, regardless of their distance from a network node. This covers the basics – It’s good for steaming HD video, basic gaming and sharing files. At $50 per month (plus taxes) it includes 1TB of data per month with an additional $10 for each additional 50GB used, you’ll pay up to an additional $100 per month. With a 100Mbps speed, this should do the job for most applications. This package is for the slightly more advanced user, for those that enjoy binge streaming and sharing large files. At $70 per month (plus taxes) it includes the same 1TB of data per month with an additional $10 for each additional 50GB used, you’ll pay up to an additional $100 per month. With a speed of 300 Mbps, you will have enough behind you for most gaming types. You’ll also be able to stream in HD on up to 10 devices at the same time. A professional installation is included in the price which will usually set you back $99. Being their most specialist package, this is the one with the most focus on gaming. Best for connected homes, telecommuting and competitive gaming, and more. At $90 per month, it’s not as expensive as other ISPs providing similar speeds. This package has an unlimited data allowance. It offers an upload speed 20 times faster than cable and you can upload a 4 minute HD video in less than a second. In terms of gaming, the Internet 1000 package is ideal for those who want a high-end experience. After all, this package has been designed for gamers. For those who play multiplayer games like Star Wars Battlefront or Elder Scrolls Online, investing in high-speed internet service like AT&T Fiber can save you a lot of frustration, and probably prevent the destruction of a lot of innocent controllers! The price of the Internet 1000 package seems a bit on the expensive side. But in comparison to other ISPs, it works out cheaper when you consider the fact that the Internet 1000 package has no data cap, and most other providers do. So if you have a few weekend gaming sessions that go on a bit too long, you might be paying for the extra 50GB’s at $10 a go. These all add up, and will soon total far more than the $90 for the unlimited data package with AT&T. Don’t let the low prices of other companies fool you. The data cap is there for a reason! Speed isn’t actually as important as you might think – as anyone who played the likes of Quake, Counter-Strike and Phantasy Star Online on dial-up connections back in the day will know, online gaming can work perfectly fine on a relatively modest data budget. However in today’s gaming world, there are advantages to having faster speeds, but you’re unlikely to notice much practical difference between, say, a 50Mbps connection and a 300Mbps one, especially when everyone else’s speeds will affect overall performance as well. Push it over 300 Mbps and that’s when you’ll really notice a difference. With AT&Ts 1000Mbps speed you’ll understand the importance of this ultra-fast connection. As long as your hardware is running at optimal performance and you’ve checked your router is configured correctly, you should be able to make the most of the internet speed at your disposal. As mentioned in the packages section, AT&T provide 3 options; 100, 300 and 1000 Mbps speeds. 1000 Mbps isn’t the quickest out there, but for most users this is more than enough. With AT&T internet, you have the ability to choose the speed you think is right for you. With different internet speeds, you’re bound to find one that fits your lifestyle. When it comes to gaming, we recommend Internet 1000. With no internet usage caps, your gaming will never be capped out and you will be able to keep up with your gaming competitors. There are usually factors to consider when it comes to experiencing randomly reduced internet speeds. The time of day is a good example. Between the hours of 7:00 pm and 9:00 pm download speeds tend to decrease by an average of 35 percent. However AT&T claim that they hold a reliability of 99% – Even at peak times. So expect to have a flawless connection pretty much most of the time. This package also has a higher bandwidth than most, which is good for multiple users. You can stream HD with up to 14 devices. This higher bandwidth is great for games night. If you and your squad set up your systems and play together in multiplayer you’ll certainly make the most of this feature of the package. Because it is fiber which is an optical technology, you aren’t dealing with all the RF-related issues like you do with a coax setup. No nicked or bent cables with reflection termination issues. No next door neighbors poisoning the signal with noise. None of that. You’ll find uninterrupted connections all day long. How does AT&T compare to the competitors? Verizon Fios – With a reputation for low latency, Verizon is a serious competitor. However it seems that they have a bit of an issue with limited coverage. Being pretty much limited to the East Coast a lot of areas don’t have access to this; A bit of a bummer for everyone west of the Mississippi. Xfinity – Other ISPs don’t even come close to their jaw dropping 2000Mbps top speed known as the Gigabit Pro package, but, there’s a but. The price of this package is around $300 per month! Frontiers FiOS -These guys are a solid runner-up. They also offer high upload speeds for gaming and some solid performance in terms of speed, latency, and packet loss. However, it’s also limited to certain areas of the U.S.
From where I’m standing, none of the above focus on the gaming sector. It’s mentioned here and there in the information pages of Xfinity and Verizon, but AT&T have more of a dedicated focus on creating high quality options for serious gamers. AT&Ts higher end Fiber packages are projected at the serious gamer. They understand the importance of low latency and have done everything in their power to avoid it. Generally speaking, the overall reviews and responses are good for the Internet 1000 package. However, there are talks of location coverage. Your neighborhood plays a big part in the success of your connection. Some areas are better than others, but the general consensus is positive. To give you a better idea of coverage, the West Coast from Chula Vista to Sacramento have exceptional coverage with more cities being added on a regular basis. There is then a bit of a gap between to West Coast and Oklahoma, but east of Oklahoma all the way to the East Coast is packed full of Fiber ready locations. The only bummer is that from New York and Pennsylvania, all the way up to Maine is a no go area at present. I’m sure there coverage map will widen over the next year, so keep an eye on the expansion. One very internet savvy customers of AT&T said that after a bit of tweaking; “On the channels and some of the protocol level stuff, and I also enabled IPv6 at the access points, because the RG fully supports it”, he was able to create his dream set up. I very much doubt that this guy will be lagging in his game of FIFA 18. Sometimes, problems with connectivity or other technical issues can come up while gaming. Anytime you need help troubleshooting your problem, AT&T is there! The gaming sector is evolving. A decade ago there was no such thing as esports. Now it’s a million dollar industry, soon to be a billion dollar industry. Fans flock around the screens to watch the favorite players do what they do best. On Youtube there are countless videos of gameplay from all types of games. Players live stream so their fans can watch them in real time. This acceleration in evolution within the gaming sector has encouraged some companies to shift their focus, and AT&T is a good example of that. Letting game fans around the globe watch you play has become popular to the point where the biggest names can make a great living from streaming, so naturally a whole generation of aspiring streamers wants a piece of that pie. If you’re into live-streaming your gameplay, good upload speed will be your main requirement – the faster the better, as you’ll want to prevent your stream stuttering or struggling when speeds inevitably dip a little. For those gamers that have done some shopping around, you’ll more than likely be aware that the aforementioned Verizon Fios is a very close competitor. Fios Internet have their credentials to hand, ranking #1 in the East for 6 years in a row. Impressive! They offer a similar package to AT&T called Fios Gigabit. At $79.99 per month, it’s certainly competitive compared to AT&Ts $90 per month costs. With Custom TV and Phone thrown in and a 940/880 Mbps internet speed on a fiber optic network with 99.99% reliability, this makes it even more interesting. In terms of your gaming needs, this sounds like a good shout. It sounds reliable and efficient. In addition to these competitive aspects some benefits of using Verizon Fios is that they also provide a decent streaming facility; Being able to choose from 7 TV plans and having access to over 130,000 episodes and movies in 4K quality. They also throw in Netflix for free for one year. This is very similar to the likes of Amazon Fire Stick and Roku products. The installation process sounds very easy, simply give them the green light and they will send round a highly trained Fios tech at a time that suits you and they will set you up and connect all of the devices to your WiFi network. If it’s not for you, you can cancel after 29 days with no costs or hard feelings. The only negatives that we can see is that they tie you into a 24 month contract (compared to AT&Ts 12 month contract). Then there’s the issue of coverage. They only really cover the East Coast at present. So if you’re reading this from the East and you don’t mind the long contract, this could be a serious contender. How do I know the AT&T internet connection is better? The result; A very low ping and latency whilst providing a fast internet connection ideal for gaming. How Fast Is My Internet Really? With AT&T internet, you have the ability to run a speed test. This test can be completed in under a minute and measures both your download speed and upload speed. Once you identify your current internet speed, you can determine if you need a faster connection. Why are latency and ping so important? They are both every gamers kryptonite, and what cause the death of so many controllers and keyboards. So, they’re quite important if you want to save unneeded purchases of the mentioned items! Ping – Ping is the measurement of how low the latency on your connection is running at. The lower the ping, the better the in-game advantage becomes. AT&T have a significantly low latency and ping rate, so your controllers will live a long and happy life. Will the Internet 1000 package really enhance my gaming experience? Undoubtedly. Yes! Say goodbye to lagging and enjoy 24/7 uninterrupted gaming for you, your friends and family. The difference is blatantly clear and from the very beginning. With the clever AT&T after care, such as the app that allows you to manage your network, you’ll be able to have complete control over your systems. Why are some AT&T Fiber internet speeds only available in certain areas? The fastest speeds are available over the 100% fiber optic network. They’re rapidly building their network in areas they serve, and they have committed to making fiber available to 12.5 million homes by 2019. Are there any hidden costs with the Internet 1000 package? Apart from the taxes which are clearly stated, and considering that there is no data cap. You’re pretty much set for the first year, however Customers who do not have any other AT&T qualifying services will experience a $10 per month price increase after the first 12 months. New Internet customers who bundle AT&T Internet with another qualifying AT&T service will enjoy every day simple pricing. Compared to most ISPs, the AT&T arrangement is simple and the only costs you pay are the agreed amounts each month.